Part of my interest in We English is to explore the layers of history in the landscapes I’m photographing. 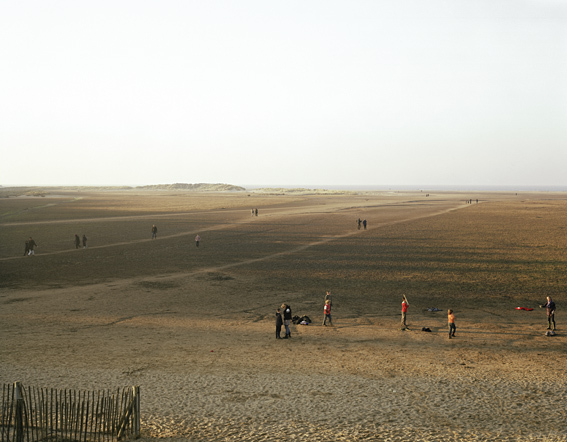 Take this picture of Holkham Beach, on the north Norfolk coastline, which I took earlier this year. The beach has long been a place of pilgrimage for holiday-makers (it was recently voted best ‘British beach for a bank holiday break’ by readers of The Times). However, when you dig a little deeper, the landscape has not always been one of harmony. And it remains a contested place with different groups laying claim to the landscape. Holkham National Nature Reserve is an extensive reserve on the North Norfolk coastline owned by the Earl of Leicester and the Crown Estates and managed by English Nature and Holkham Estate. As with so much of the English countryside the visual appearance of this stretch of the Norfolk coast is a part wilderness and part constructed landscape. From Burnham Overy to Wells the low-lying marshes north of the coast road used to be tidal saltmarshes, separating offshore shingle and dune ridges from the main coastline. The tidal creeks were large enough to allow ships to load cargo from a staithe at Holkham village. From 1639 onwards a series of embankments were constructed by local landowners, including the Cokes of Holkham. By the time the Wells embankment was completed in 1859 by the 2nd Earl of Leicester about 800 hectares of saltmarsh had been converted to agricultural use. In the late 19th century the 3rd Earl of Leicester planted pine trees on the dunes, creating a shelter-belt to protect the reclaimed farmland from wind-blown sand. Being close to Sandringham it has also been popular with the Royal Family who occasionally makes visits to their beach hut set back from the dunes. It was particularly popular with the Queen Mother whose own entourage, using the beach back in the thirties, were rumoured to have been responsible for establishing this stretch of sand as a gay beach. However, the landscape has not always been one of harmony. In the late 1880s, class collisions in East Anglia were most clearly found in areas where people spent their leisure time. While the English understood the codes of behaviour which applied to different social orders in the domestic or work place, these codes were less fixed when people were on holiday. Whole sections of newly mobile classes were likely to meet more often in unpredictable circumstances. The chief attraction of the Norfolk coastline were sports like fishing, shooting sailing and seaside holidays. It was now easy to reach by rail from London, where larger numbers of people had money to spare for holidays. But the numbers and social diversity meant that the middle classes, who were used to distant and uncomplicated relations with the locals, found their holiday-making changed into something much less welcome. Evasion was not always possible, no matter how much it was desired. As John Taylor highlights in his book, A Dream of England, “the fear of class collision meant that the landscape was a place of exclusion and tension, factors deriving from the fascination and repulsion that the middle class felt of the lower classes”. More recently, a moral backlash was sparked when the press were alerted to a campaign by the warden, Ron Harold, to “clean up” the nudist beach popular with local gays. Harold is an employee of English Nature; an organisation ostensibly set up to promote conservation. He declared he would seek a citizen’s arrest on anyone he found cavorting together in the dunes and woods. After a total of five arrests in that first year, Harold erected new signs across the beach prohibiting nudism above the high watermark. The car park prices went up to pay for another warden to assist in the moral policing of the beach. This entry was posted on Monday, June 30th, 2008 at 3:37 pm	and is filed under LANDSCAPE, REPRESENTATION. You can follow any responses to this entry through the RSS 2.0 feed. Both comments and pings are currently closed.